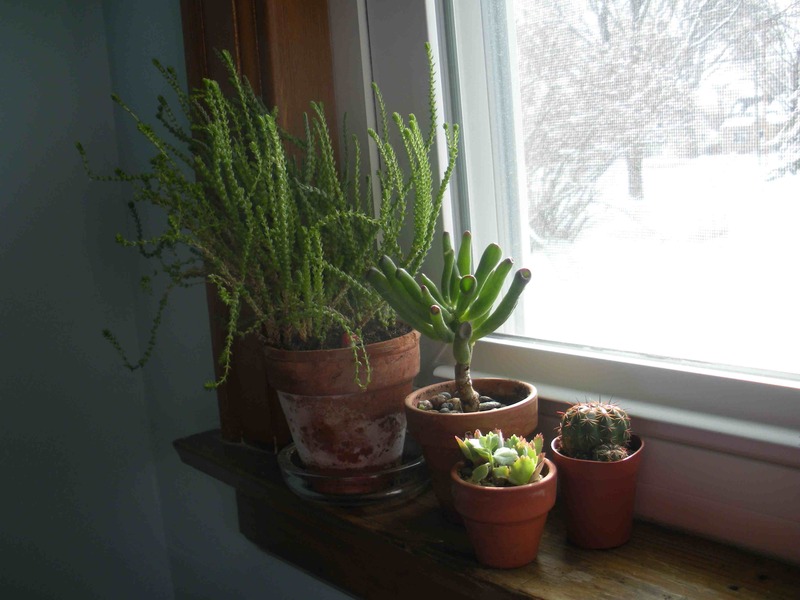 My tiny farmers’ market plants have (almost) made it through the winter—and gained a few companions, too. Is it wrong that I’m already missing winter and the sparse pleasures of a snowy landscape? Winter isn’t over yet, really—I know better than to believe fully in this gray and muddy thaw—but, while trawling through my photo library in hopes of discovering something unpublished that I could use to break my blogging silence, I found this little bit of green and white and found myself suddenly longing for the kind of light that only happens in a very snowy place. That was a very long sentence. A very long way of saying (I summarize now in a fragment) that I love winter. I couldn’t live without it. And it’s funny that the thing I really love about winter is the light—because there is, for so long, so little light. But what light there is can be so stunningly bright—and perhaps that’s why I love it so. Then again, I’m very, very good at having a very, very selective memory…and perhaps that’s what we have to do to survive, particularly when we live in Wisconsin. From one flâneur to another, I enjoyed your eulogy to winter passing. In the Adirondacks, on the shores of Lake Champlain, spring-come-early has so deviously and so fiendishly enraptured me that I’ve lost your wisdom: “I know better than to believe fully in this gray and muddy thaw…” I no longer know better… It’s sunny, warm, plants are waking up. I too am a lover of winter. And spring, summer, fall. But I’ve lost my sense, so intoxicated have I become with the budding trees and the reaching crocus and daffodil sprouts! I love that light, too. Especially here, where the weather fronts move so fast in the absence of mountains, it tends to be incredibly reflective, not overcast as often as Pittsburgh. I’ve woken up and just known that it has snowed over night, just by the quality of light against my walls.